Heads up for the late night drivers or early morning commuters. 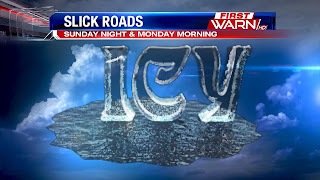 Moisture from the melting snow and rain has been re-freezing to roads Sunday evening. I've been hearing many reports of cars and people sliding on the roads and in parking lots. Please be careful on the drive, especially back roads. You can't see black ice, but can tell it's there. Especially if the roads has a 'wet' appearance to it. 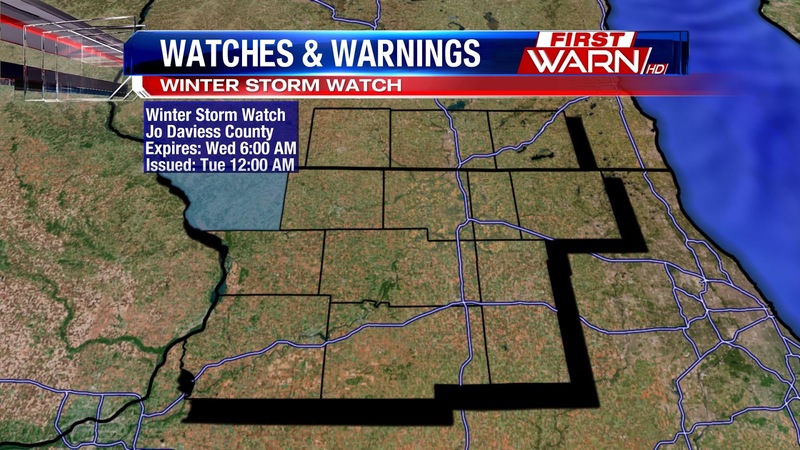 Winter Storm Watch remains in effect for Jo Daviess County beginning early Tuesday morning. High accumulations of snow/sleet possible by Tuesday night. Good evening! Current thinking regarding Tuesday's storm system. 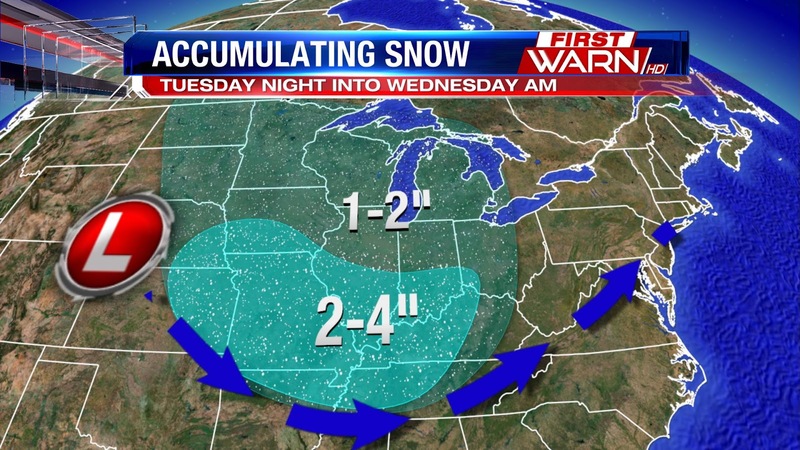 Heavy snowfall expected Northwest of Illinois and Southern Wisconsin. A little bit of everything possible closer to home. The forecast for Tuesday is still a difficult and unclear one. However, as the day approaches, we are slowly getting a better grasp on what will happen here in Northern Illinois and Southern Wisconsin. The system that will affect the Midwest, Great Plains, the South, and the Great Lakes is still in the Pacific Ocean, but will come onshore Sunday. Once that occurs, we will be able to sample it and get a better idea of what it will do. As a result, the forecast models will have a better handle on it, and their solutions will likely be much closer to what will actually happen. For now, there are essentially two main tracks the low pressure could take once it strengthens near the Texas and Oklahoma Panhandles. Track #1 is the track the GFS and European models suggest, which is shown above. That particular track would take the low right over Rockford. If that happens, much of the region would be in the "warm sector" of the system with warmer air surging north from the Gulf of Mexico. That would result in temperatures in the middle to upper 30's, meaning mostly rainfall for the Stateline. Heavy snow and blizzard-like conditions will be located to our northwest if this solution occurs. Then, we have the Canadian model and the NAM model (short-range American model). They are showing a solution that takes the low pressure to our south near La Salle-Peru. If that solution occurs, we would remain on the cold side of the system. As a result, we would likely remain the lower 30's, which would equate to more snow and wintry precipitation as opposed to plain rain. This solution would also mean wintry precipitation accumulation for much of the area by Wednesday morning. However, with these four models split right down the middle, it is still very difficult to jump to any sort of finalized conclusion. It does look like the models are slowly edging towards the milder solution of late. That is not a final forecast, but it is a pattern that cannot be ignored. So, at this time, it does look like there is a higher probability of more rain than snow. That is about as in-depth as we can get with this system now. Just be aware that a strong system will affect the region Tuesday, and there will be a lot of precipitation associated with it. By Sunday afternoon, we will have a better idea of what kind of precipitation and how much of it we will see, so be sure to check back! It was a quiet Friday with highs slightly above average. The milder temperatures continue this weekend with highs expected to warm into the lower and middle 40's as a result of strong southwesterly winds. 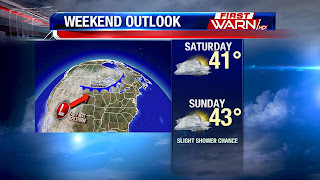 A weak system will move through on Sunday and bring some light rain showers to the area. That system will have an impact on what we see next Tuesday with a potent storm system that has its eyes set on the Stateline. If the system on Sunday can strengthen enough and pull more cold air down from Canada on Monday, then Tuesday's system could feature more snow than rain. At this time, it is nearly impossible to infer whether or not Sunday's system will drag enough cold air in for a mainly snow event on Tuesday. What we do know is that a strong low will develop in Colorado and move northeastward towards Northern Illinois on Monday and Tuesday. We also know that plenty of precipitation will fall with this system, regardless of what type. Lastly, we know that heavy snow and blizzard-like conditions will accompany this system to the north of the low's eventual track, and strong to severe thunderstorms will exist in the warm sector to the south of the low's eventual track. What we are still in the process of determining is the low's exact track, which is extremely difficult to do until the system makes landfall in the West and is accurately sampled by weather sensors. Right now, that system is in the middle of the Pacific Ocean, which is why nailing down the forecast is not easy at this moment. It appears as though models are consistency believing that we will see a decent amount of wintry precipitation, but mentioning totals is not feasible at this time. In the simplest terms, just be aware that Tuesday and Wednesday will be messy, and potentially hazardous. This will be a situation that will require you to check back many times as updates will continue to occur. After the system exits, plenty of colder air will filter in from Canada later next week. Highs will be in the teens and 20's with lows in the single digits! 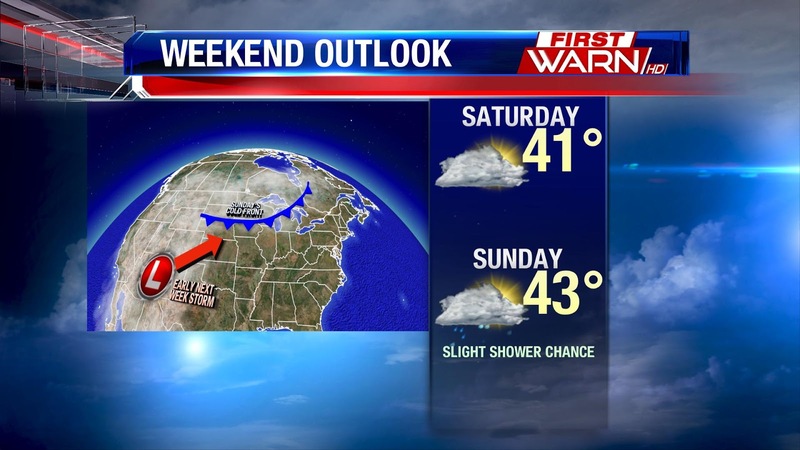 A ridge of high pressure moves in for the weekend giving temperatures a boost into the low to mid 40's Saturday and Sunday. While it won't be completely sunny, we will manage a little sunshine. With warmer air and an increase in moisture, I can't completely rule out a passing shower or even a light snow/sleet mix north of the state line early Saturday morning. A weaker area of low pressure on Sunday could bring a few light showers to the area Sunday afternoon, but it won't be a complete wash out. Unfortunately the warmth doesn't continue into next week. A cold front arriving from the north will bring us back to reality on Monday with temperatures falling back into the mid 30's. But we can say bye-bye to a lot of the snow! Interested In Becoming a Trained National Weather Service Storm Spotter? Then you'll want to attend one of the upcoming spotter training classes. So far the only office to post their spotter training class schedule is the Chicago National Weather Service which covers North-Central and Northeast Illinois. As soon as the Quad Cities NWS (which covers Stephenson, Jo Daviess, Carroll and Whiteside counties) and Milwaukee NWS (which covers Green, Rock and Walworth counties) post their class schedules, we will be sure to pass them along! It's been all the talk lately...how much snow are we going to see? Will it fall as all rain or will we get a messy, wintry mix? 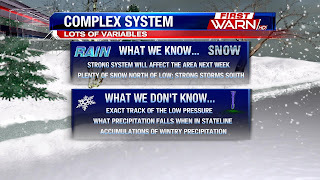 Unfortunately, those types of questions can't be answered this far in advance, but there are some details we can dive into in regards to next week's storm system. Now you may be asking yourself, "They have all these fancy computer models. Why can't Meteorologists give us a detailed forecast with this storm?". The answer, the storm system in question is still in the middle of the Pacific Ocean and only being sampled by buoy and satellite data. When you think about it, that's not a whole lot of information about the storm being fed into our numerical forecast models. It would be like me saying I can guarantee, 100 percent, that I can do your complicated tax return because my husband is an accountant and tells me a little about his job. It just doesn't work like that. This storm is still going to be off shore for the next several days - likely until the end of the weekend. Once the upper part of this system moves onshore, it will be sampled by numerous weather balloons, surface stations, airplane sensors, etc. That's a lot more information then fed into our numerical weather models to help us pinpoint the track of that low pressure system. So until at least Sunday, and possibly Monday, it's very difficult to say for certain what will occur for Northern Illinois and Southern Wisconsin. But we can look for patterns that would give us a little more confidence in one scenario over the other. One key factor into the possible storm track of Tuesday's low is just how much cold air filters in behind Sunday's cold front. This front will bring us a few showers on Sunday afternoon. Following the front, colder air will spill into Southern Wisconsin and Northern Illinois. Just how deep and the amount of cold could push Tuesday's low further south. If that's the case, then enough cold air would be in place for the potential of accumulating snow. If, however, the cold air isn't as deep or strong then the low would likely track further to the north and northwest. This would allow warmer air to be pulled northward giving Northern Illinois and to some extent Southern Wisconsin a higher likelihood of a mixture of snow, sleet and freezing rain. What you need to know now is that there will be an impactful storm early next week. And with it heavy snow will fall, but just where. And that's all dependent on the storm track. Unfortunately, we may not know the exact path until Sunday night or evening Monday afternoon. So stay with the First Warn Weather Team through the weekend and early next week, especially if you have plans Tuesday or Wednesday. Light Evening Snow, then a Weekend Warm Up! Temperatures for your Wednesday will hover close to average, near 30° but there is a nice warm up on the way! First though, there is some light snow in the forecast this evening. An Alberta Clipper will dive southeast into the Midwest today, tracking through Minnesota and northern Wisconsin. The greatest snow accumulation will stay closely tied to the low in northern Wisconsin, but an accompanying wave of energy will help to bring enough lift over the Stateline to squeeze out some light snow and flurries. 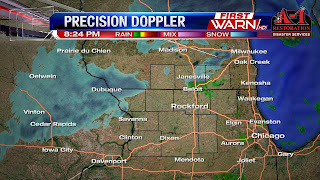 The area with the greatest potential to see some accumulation will be in far northeastern portions of the Stateline. Overall, only a dusting to a tenth or two of an inch is expected, it could be just enough to bring some slick spots on roads Thursday morning. A ridge will then build into the central portions of the U.S. and this allows temperatures to climb a little more each day. The warmest days this week look to fall on the weekend, with highs Saturday and Sunday reaching the lower 40's. Another quick system will move out of the Rockies and into central Wisconsin and will bring with it a chance for lighter rain with the system's cold front. Because the bulk of the energy passes north, that is where a little more moderate rain will fall. Rain looks to then transition to a light mix overnight as temperatures fall below freezing. Monday then looks to be colder with a cold front passing, allowing temperatures to fall into the mid 30's. Strong Storm System Next Week? The main weather story for the remainder of the week into the weekend is the milder temperatures that are in store. As high pressure builds to our south and southeast, a ridge will form in the Central United States. As a result, southwest winds will bump warmer air into the Southwest, Southern Plains, and Midwest. While the Stateline is not in the center of that "warmer" category, we are on the fringe, which means milder than average temperatures will occur as we round out this week and head into the weekend. That means high temperatures will be in the middle to upper 30's with a few days possibly seeing highs in the lower 40's, especially south of the Illinois-Wisconsin border. Lows will likely be in the 20's and 30's during this stretch, which is well above normal for late January and early February. This pattern will eventually be broken down, and that will happen early next week. A low will form in California and traverse into Colorado Sunday into Monday. As it does so, it will strengthen rapidly and draw in plentiful Gulf of Mexico moisture. As a result, once the low moves out into the Plains, it will have a lot of precipitation to dump. All forms of precipitation are likely with this system. Heavy snow from Colorado to Wisconsin, heavy rain from the Gulf Coast into Illinois, and even some severe weather is possible to our south early next week. There will also be warmer air being drawn into the system, which means any location near or south of the low's exact track will likely see warm enough temperatures to see plain rain as the dominant precipitation type. And, as of now, that looks like the most probably outcome for Northern Illinois and Southern Wisconsin. While it is still nearly a week away, models have been consistent in showing this system move right over the area, which would place the Stateline in an area favorable for rain. However, it is important to note that the entire event won't be rain. It is possible that we start off as snow or a mix before the warmer air arrives and changes us back to rain Monday into Tuesday. It also appears some light snow flurries will end the event Tuesday night into Wednesday. Again, this is still nearly a week out, but confidence is continuing to grow in a significant storm system affecting the Midwest, Great Lakes, Plains, and Mississippi Valley early next week with anything from heavy snow to rain to severe thunderstorms. Determining the exact outcome for any one location is not 100% possible yet, but confidence is growing regarding the Stateline seeing more rain than anything else. Stay tuned! 8:30pm Update: The light snow is becoming a little more widespread this evening, but we'll still continue with the light snow showers - and even in some locations the light mix - through Midnight. Temperatures by Tuesday morning will be in the upper 20's. 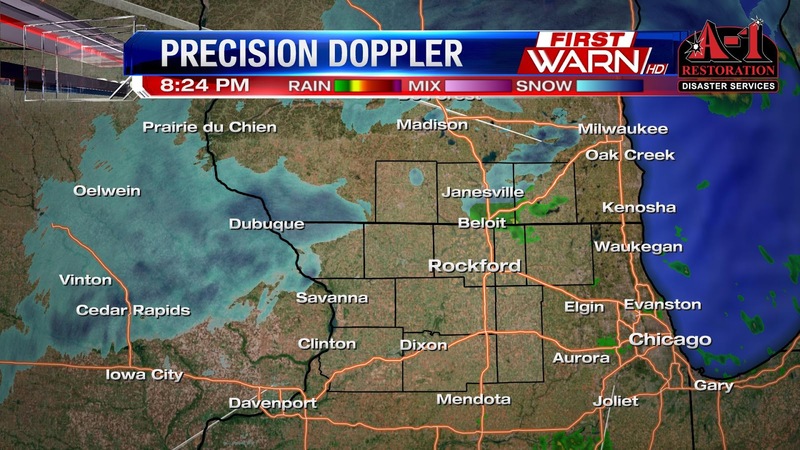 6:25pm Update: Light, to at times moderate, snow continues to fall over Northern Illinois and Southern Wisconsin. 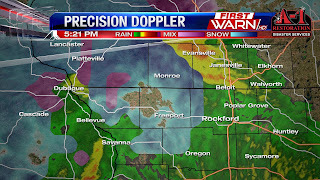 At times it's been mixed with a little sleet north of Rockford. 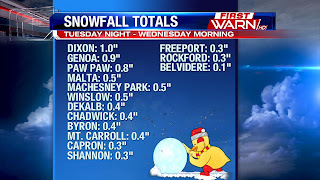 I've even received reports of minor accumulation near Freeport, Warren and Lena. 5:40pm Update: Light snow is currently falling at the WTVO studio west of downtown Rockford. I've also received a report of sleet falling in Roscoe. Surface low pressure is now moving into Northwest Illinois and Northeast Iowa. To the east of the low, temperatures are above freezing. But in Southern Wisconsin and Northwest Illinois temperatures have cooled down near freezing. This has caused the precipitation that has been falling to fall as either freezing rain, sleet or light snow. I've received several reports of roads, sidewalks and driveways becoming slick in and around Freeport due to the light freezing rain. 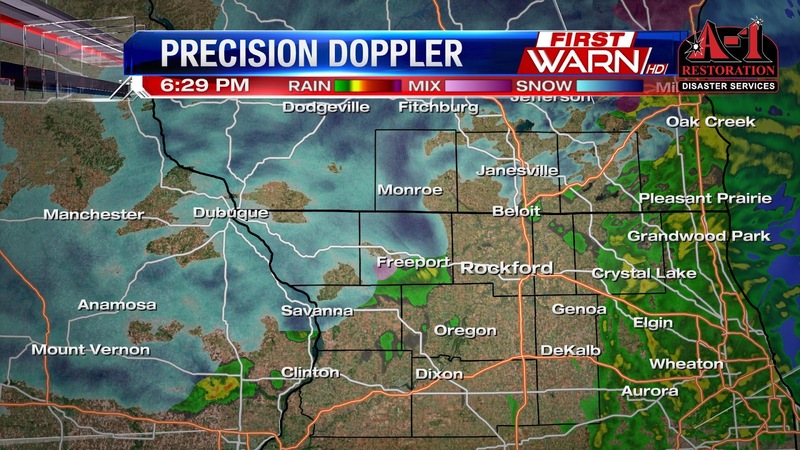 A little sleet could mix in with the light drizzle closer to Rockford over the next couple of hours. Take it slow on the drive Monday evening. Eventually this mix will transition over to light snow after Midnight. 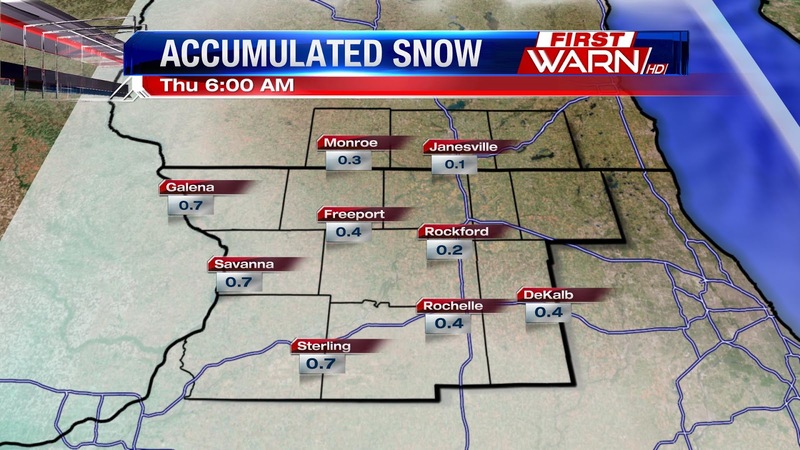 Minor accumulations are possible by Tuesday morning which could make Tuesday morning's commute slick as well. After a relatively quiet weekend, the weather will be on the soggier side today. A developing low pressure system in Kansas is already prompting Winter Weather Advisories just to the west of the Stateline area. To the west in Iowa and portions of central Wisconsin look to pick up more winter weather, with ice and snow through the afternoon. For northern Illinois and southern Wisconsin, things will be a bit different. The current track of the low pressure system looks to push through Missouri and then into northern Illinois and southern Wisconsin. Because of that, the Stateline area will remain mostly in the warm sector of this system. With southerly flow up above, we draw in the moisture and more mild air from the south. With moisture flowing in from the Gulf, dew points will steadily rise through the day, allowing for temperatures to rise as well. Temperatures today will warm into the mid and upper 30's by the mid afternoon, and this is also when the best moisture arrives. Because of that, the chance for rain or drizzle is low through about lunch time, but it's still possible.With temperatures near freezing, freezing drizzle is also possible. Rain will then lift northward from the southeast today, so as we head through the afternoon rain will spread through the Stateline area. Overall the rain will be light but steady through the day. Temperatures tonight will then begin to fall, from 7pm onward snow will begin to mix in with the rain, then turning to all light snow after midnight. 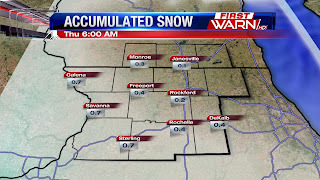 The snow comes to an end early Tuesday morning, and overall little to no snow accumulation is expected. However, there could be some slick areas on roads for the early commute on Tuesday. We have relatively quiet of late, but we will see our next system on Monday and Tuesday. It has been a headache to forecast because of the complicated thermodynamic profile associated with it. We could see freezing drizzle, sleet, snow, rain, or a mix. However, as the day continues to get closer, models are beginning to get a better hold on the event. A low pressure system will develop in Oklahoma and move northeast towards Rockford--likely moving overhead on Monday late in the afternoon. It will draw in moisture from the Gulf of Mexico, so there will be some precipitation for the low to work with. With the expected path taking the low directly over Northern Illinois, sufficient warm air will be drawn in from the South to support plain rain for a good portion of the system's duration (referred to as warm air advection). As a result, our expected snow totals are very minimal at this time. The colder air will be in place to our north, but for the Stateline itself, temperatures are expected to rise into the middle and upper 30's Monday afternoon before cooling back down late in the evening. Once temperatures cool enough late Monday evening, the precipitation will switch to a rain-snow mix before transitioning to plain snow by 10-11pm. So while it is with pretty high confidence that snow will be the dominant precipitation type to our north and west, and mostly rain will fall to our south, our particular region is in a tricky area. Confidence is still not very high regarding when exactly the snow will begin, or how much snow can be expected. Everything will come down to how warm we can get Monday early in the evening, and how quickly the cold air begins to push the warmer air away. Again, it does look like snow accumulations will be very light. The bitterly cold arctic air that was around for a stretch of days is gone. After seeing a few days with highs in the single digits and lows below zero, our temperature trend has been going up. 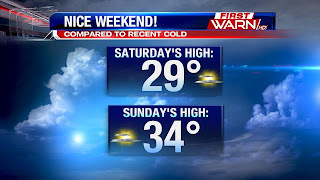 In fact, our expected high temperature on Sunday of 32° will be 28° warmer than our high last Sunday of 4°. So, if you are not a fan of the arctic air, the past few days have been much better. Looking upstream--to the west and northwest where our weather patterns originate and come from--there does not really appear to be much in the way of arctic air gathering. As a result, there will not be any fresh cold filtering into the Northern Plains, Upper Midwest and Great Lakes regions for the foreseeable future. Despite there not being any truly arctic air in the forecast, there is some cold air showing up on one of the two long-range forecast models we use. While the European model suggests 30's and 40's late next week, the GFS model is showing cold air with highs in the 20's and lows in the teens. Does that mean we will see temperatures in the teens and 20's? No. It means there is a possibility of seeing cold air next week, but with the disagreement among the models, it is difficult to say just how cold it will be. One thing we do know is that it won't be arctic cold. Looking into the end of January and beginning of February, the Climate Prediction Center's outlook is showing a decent probability of seeing temperatures above average. This would suggest highs in the lower to middle 30's and potentially higher as we ring in February. We're kicking off the weekend with high pressure nearby allowing for lots of sun and temperatures warming into the low to mid 30's. 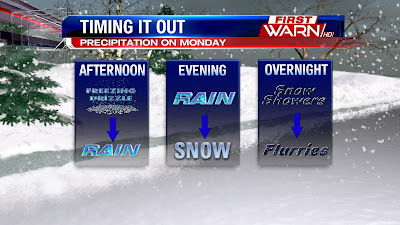 Weather begins to change as you head back to work on Monday with a rain snow mix possible. Some of the details have changed a bit on what we can expect. Breaking down the set up, high pressure will build into the southeast while low pressure develops near the Rockies. With this set up, the Midwest receives southerly flow and an inflow of moisture from the Gulf. A short wave of energy will travel northeast through the middle and upper Mississippi River Valley. The wave system has been slowing down, so the beginning of precipitation doesn't look to start until later in the afternoon for northern Illinois and southern Wisconsin. The energy wave doesn't look to be particularly strong, as well as the low pressure but we still look to pick up some precipitation. Temperatures with the southerly flow will warm into the low to mid 30's through Monday afternoon as rain spreads north through central and then northern Illinois. For northern Illinois however it will start will more of a rain snow mixture with temperatures hovering close to freezing. 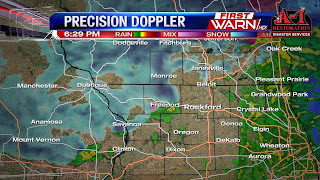 A light rain snow mix will continue late Monday afternoon into the evening. as temperatures overnight fall into the upper 20's this mix will then switch over to all snow. Light snow will continue overnight into early Tuesday morning. There is moisture available, but not much, so looking at this distance accumulations will be minimal if we get any at all. Nice weather is probably something you've been looking forward to seeing with the arctic air outbreak we saw a few days ago. And that is something we will see this weekend. Temperatures are expected to be above average in the upper 20's to perhaps middle 30's under mostly sunny to partly cloudy skies. Not only will the temperatures be considerably warmer than where they were a few days back, but the sunshine will help make it feel even warmer! The reason behind the nice stretch of weather is a dominant high pressure system moving into the region from the northwest. This will keep our winds relatively calm this weekend, and it will keep storm systems and much of the cloud cover away from Northern Illinois and Southern Wisconsin. It has been quite some time since we've seen temperatures above average in tandem with sunshine. With the chance for rain and snow on Monday, I encourage you to get out and enjoy this weekend's weather! Looking into next week, it appears as though we will continue to trend of milder temperatures as only two of the next eight days are expected to be below average! Our average high for this time of the year is 29°, and that total will likely be eclipsed Sunday, Monday, Tuesday, Thursday, and Friday. Truly arctic air does not appear to make a return in the foreseeable future, per the latest forecast models. However, it is important to remember things can change, so I would not completely rule out more arctic air before the winter officially comes to an end! A quiet pattern takes shape for the end of the work week and weekend with another high pressure system building in. Models now are starting to pick up on a developing low pressure system that will bring us a chance for snow and possible rain on Monday. It is still too far out to say for sure, but currently the trend is for a low pressure system to develop in Oklahoma over the weekend. The low pressure system will then track through mid-Missouri and then into western Illinois. 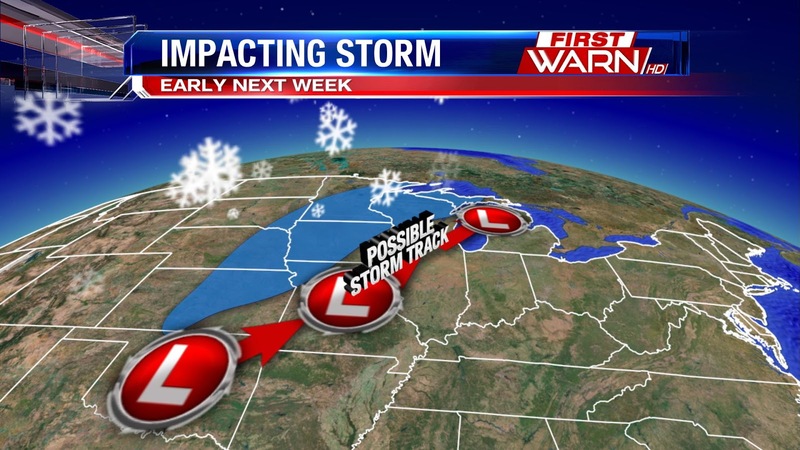 The track will continue northeast into northern Illinois and southern Wisconsin. Ahead of this system, temperatures will be warming into the low to mid 30's with a more mild southerly flow in the upper levels of the atmosphere. Temperatures on Monday will also warm into the low 30's ahead of a warm front. With temperatures around the freezing mark as this system approaches, we could see this first start off as rain before a cold front passes and temperatures fall turning this over to snow. Moisture levels aren't terribly high going into Monday, so as of now we won't see much accumulation, but it's something we will continue to track as we get closer to it! It wasn't much snow, but enough to put a dusting down on the roads and a fresh coating on the grass. 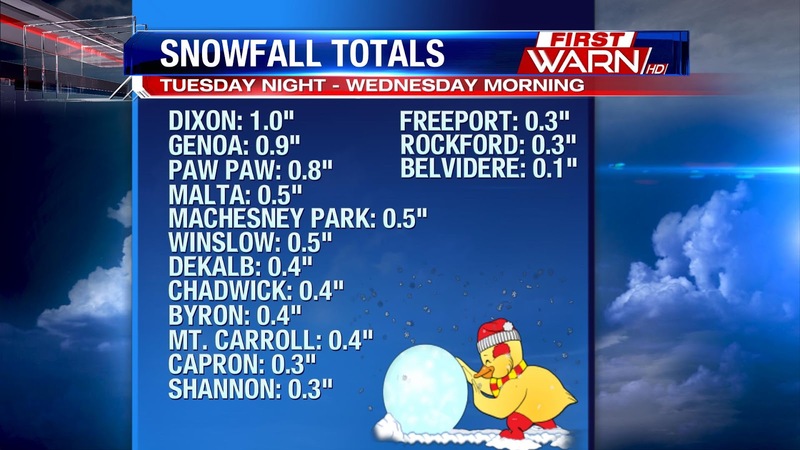 Snowfall totals were less than an inch and generally less than half an inch area wide. There isn't much snow, or rain, in the forecast for the next few days. A few flurries may fly through the skies late Thursday night into Friday morning. Another system early next week may bring a mix or light snow with it Monday or Monday night. Get ready! Because a spectacular sight that hasn't been seen for 10 years will return for the next few weeks. Five planets - Mercury, Venus, Mars, Jupiter and Saturn - will align in the south sky roughly an hour to hour and a half before sunrise between now and February 20th. According to Accuweather.com, the final days of January and the first week of February may prove to be the best time to view the planets. This is because the moon will slowly move across the sky making a close approach to each of the planets. So if there isn't a threat for clouds these next few nights, it may be worth the early wake up call to see if you can catch a glimpse of this spectacular sight. For more on viewing the planets, click here. With a little light snow in the forecast Tuesday night, I figured it was time to look at where the numbers are for precipitation and snowfall for the month of January. Overall, January has been a slightly cooler and drier month. The cold push really coming with the recent cold snap we're just ending. But for precipitation, we've really seemed to miss out on the bigger snowfalls. Total snowfall for the month adds up to just over three inches, nearly three inches below where we should be for the 19th of January. Total snowfall averages 10.2" in January, the second snowiest month in the winter season. The light snow tonight won't help with the deficit as we're only expected to receive a few tenths of an inch through Wednesday morning. 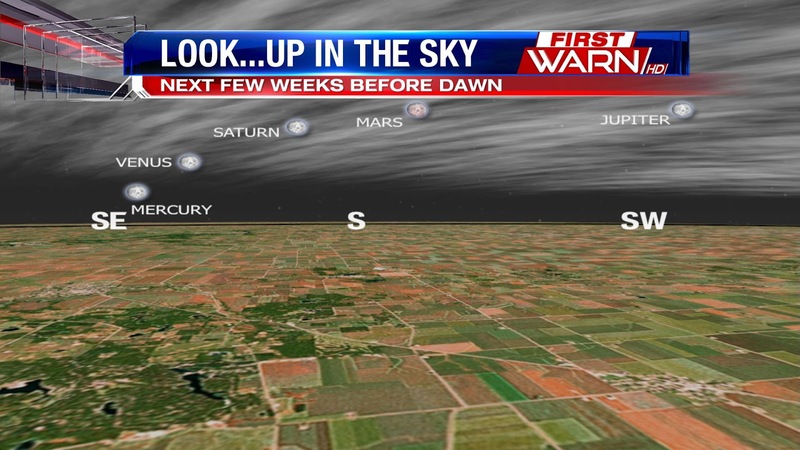 Following Tuesday night's system, our skies remain dry until possibly late in the weekend. It's another morning in the Stateline with subzero overnight lows and chills near -15°, but the cold will now make way for some accumulating snow overnight into Wednesday morning. The arctic high pressure responsible for the bitter cold is now shifting east ahead of a low pressure system. The low pressure will track south of Illinois from Nebraska into the mid-south before it strengthens moving along the east coast. To the north of us another high pressure system is present that is advecting drier air into the Midwest. The dry air will battle against the low pressure system and will limit our snow accumulations. Winter Weather Advisories are in place for southern Iowa, south central Illinois, Missouri, Indiana, Kentucky, and Tennessee. Closest to the low 3-5" is possible and 2-4" for central Illinois. For northern Illinois and southern Wisconsin the accumulations will be minimal, with about a dusting to about a half of an inch expected. The rest of the week stays fairly quiet, as temperatures finally warm above freezing by Sunday. After bitter cold air gripes the Stateline Monday and Tuesday, there will be a moderation in temperatures through the end of the week. The core of the cold air will shift east of Northern Illinois and southern Wisconsin into Tuesday. Our next system moves on shore today from the Pacific and will push southeast Tuesday morning. 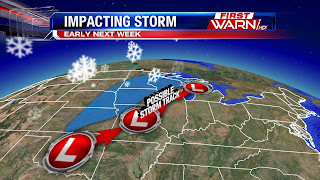 The system develops into a low pressure in the southern plains Tuesday morning bringing lighter snow. The system then looks to track east and south of Illinois through the mid south. With this current track in place, northern Illinois and southern Wisconsin looks to accumulate 1-2". However, it will be battling dry air that will be moving in around our high pressure system; that system will be to our north and pushing eastward. Heavier snow stays contained closer to the actual low, with about 2-4" possible. The snow looks to begin late Tuesday night and will last through Wednesday morning, you'll want to allow a little extra time for your commute Wednesday morning. The low will then strengthen as it lifts northeast and tracks along the East coast. This will be one of the season's first Nor'easters that could bring more accumulating snow along the east coast. 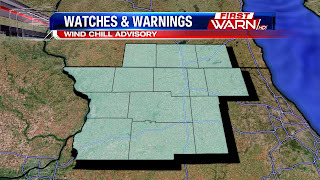 The Wind Chill Advisory has been extended through Noon Monday in anticipation of wind chill readings remaining between -25 degrees and -30 degrees through Monday morning. Already wind chill values have fallen close to -30 degrees Sunday night as temperatures continue to drop below zero. It's important to remember that if you have to go outside while it's this cold, to cover any and all exposed skin. Frostbite can occur within 30 minutes if you're not dressed properly. And spending any prolonged period of time outside could also lead to hypothermia. The coldest wind chill values will occur Sunday night through about 10am Monday morning. As the temperature gradually warms above zero degrees Monday afternoon, wind chills will rise to the teens below zero. Still cold, but not as cold as what they started out with. Unfortunately it looks like our wind chill values will remain below zero through Tuesday morning. The arctic air has arrived in the Upper Midwest and Northern Plains. North Dakota, South Dakota, Minnesota, Iowa, and Wisconsin are all see subzero temperatures this evening. Those temperatures will continue to fall and spread southward into the Stateline by late tonight. We will likely dip below zero by Sunday morning with my forecast low currently at -2°. That is not the end of the story, however. Winds will be breezy at times during this arctic air outbreak. Thus, we will have bitterly cold wind chills to deal with. As a result, we are under a Wind Chill Advisory from midnight until 11am Sunday as the National Weather Service is anticipating dangerously cold wind chills. You can see that advisory includes the entire region. Now, just how cold will our wind chills go? As it looks now, they will likely dip into the -15° to -25° range tonight with blustery west northwest winds upwards of 15mph combining with temperatures near zero. As for Sunday, don't expect much relief as temperatures will only rise to near 2° under a partly cloudy sky. It will be a day with very deceiving sunshine. Wind chills Sunday will remain well below zero as well, with readings likely between -15° and -25° again. With numbers this cold, the conditions are going to be hazardous to dangerous at times. The main issue will be frostbite, which can occur in less than 30 minutes on exposed skin. Therefore, it is highly advisable to limit outdoor exposure thru Tuesday morning because wind chills will remain dangerous. If you must venture out, it is a good idea to bundle up as much as possible and cover all of your skin. If you suspect you may have frostbite, get it looked at by a professional immediately as it can cause severe damage to your skin. Another important reminder with the cold is to keep your car's gas tank at least half-full because subzero temperatures can cause problems if your gas tank is too low. Lastly, it is also important to bring all pets inside because they cannot cope with the dangerous cold either, so letting them stay outside is not a good idea. 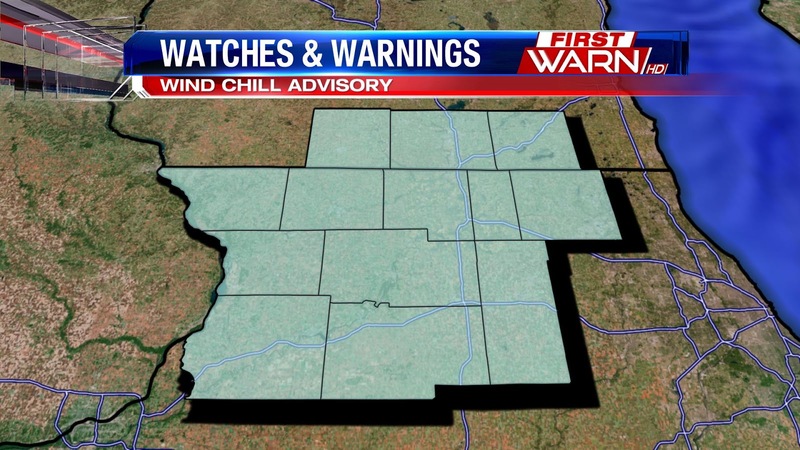 What is a Wind Chill Advisory? Yet another arctic blast is in the forecast for Northern Illinois and Southern Wisconsin as we head into this weekend and early next week. The thing about this blast of cold is that it may be even colder than our previous arctic air experience earlier this week. A departing low pressure system is turning our winds northwesterly this evening, and that is going to allow arctic air to plunge into the area beginning on Saturday night as lows fall to near 0°. High temperatures on Sunday are only going to rebound to near 2° with some areas possibly remaining below zero. The coldest time will be Sunday night as temperatures are expected to fall as low as -5° to -10°, especially in outlying areas away from city centers. During these frigid times, we will have blustery winds 10-20mph out of the west and northwest. That will lead to wind chill temperatures well below zero. In fact, we could see wind chills late Sunday night into Monday morning in the -20° to -30° range. The heart of the arctic air will likely remain in Minnesota, Northern Wisconsin, and Eastern North Dakota, but our wind chills will likely lead to the issuance of a Wind Chill Advisory or Wind Chill Warning (see graphic above for information on those and what leads to their issuance). 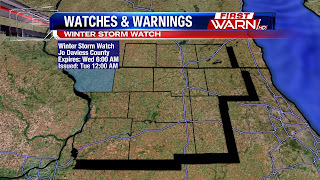 If issued, it would be the first time this season we see that weather headline for the Stateline. While we've experienced bitterly cold temperatures, we have not had the wind component at the same time, which explains why we haven't seen Wind Chill Advisories or Wind Chill Warnings yet this winter. Temperatures will stay in the single digits on Monday with subzero lows Monday night again expected. Here is what the wind chill temperatures will look like for the next 48 hours. Notice the downward trend thru Saturday and Sunday with minimum wind chills likely approaching -30°, especially from Rockford north and west. Wasn't the 40 degree afternoon Thursday nice? A lot better than the teens the other day and the sub-zero temperatures we've been waking up to lately. Unfortunately our quick January thaw looks to be ending by the end of the weekend with a rather quick return to an Arctic air mass. But could there be light at the end of the month? When we look at the month of January as a whole, we've really only had four days where temperatures were below average. Every other day was right on, or slightly above. And so far the month is averaging 0.5 degrees warmer than the monthly average. Now, with the single digits highs and below zero lows coming up next week I'm sure that number will go down slightly. However, another changing atmospheric pattern may allow temperatures to rise slightly above average for the middle of the country by the end of the month. 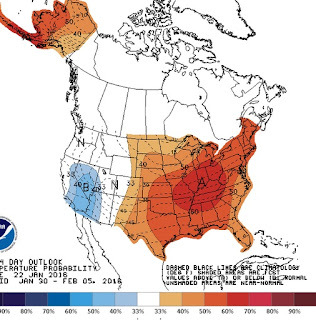 The two week outlook from the Climate Prediction Center highlights the Plains and Great Lakes for a higher probability of experiencing temperatures above average. This comes as both the AO (Arctic Oscillation) and NAO (North Atlantic Oscillation) begin to turn positive. Both have been in the negative which has helped generate some of the cold lately. It's important to note, though, that forecasts for the AO and NAO may change slightly and even though temperatures may warm, there could also be below average days mixed in. Along with the warm, the weather pattern will turn a little more active for most of the country bringing a higher probability of more precipitation. So if the single digits highs and bitter cold wind chills are not your thing, let's hope the end of the month will be warmer! 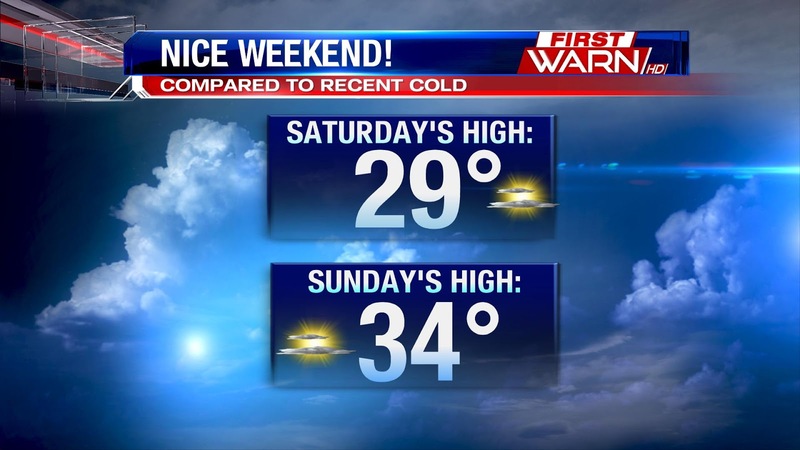 Even Colder Air This Weekend? First the rain, then the Snow?